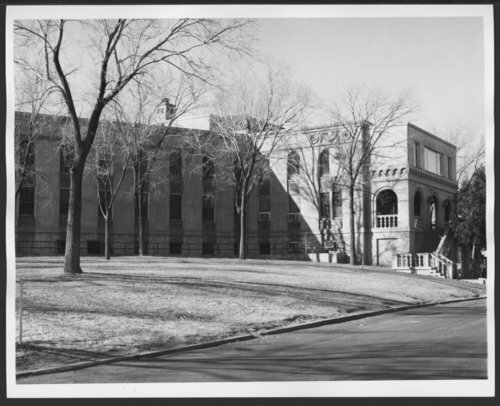 This black and white photograph shows the Atchison, Topeka & Santa Fe Railway Company hospital in Albuquerque, New Mexico. The facility opened in 1921 to provide medical treatment to Atchison, Topeka & Santa Fe Railway Company employees. In 1982, the building was converted into a mental health institution and renamed Memorial Hospital. The institution provided psychiatric services until it closed its doors in 2007. The Italianate style building was later placed, in 2007, on the National Register of Historical Places. In 2010, the historic property was refurbished into a boutique hotel called Hotel Parq Central.